You want the cutest possible centerpieces for your wedding shower, whether you’re the soon-to-be bride or you’re the maid-of-honor who’s doing all the planning. Check out this clever and simple idea for adorable wedding shower centerpieces. Start by making sure your pictures fit the frames perfectly. Tape the pictures in against the glass (you may need to glue the sides of the glass to the frames). 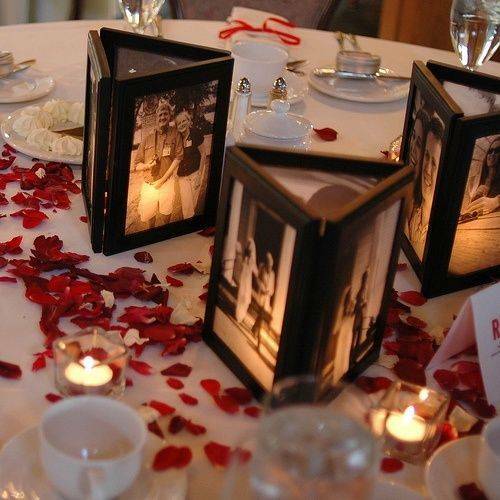 Leave the backs off of the picture frames, because that’s how the beauty of this centerpiece is created! Next, you’ll want to stand the frames on their ends and create a triangle by placing the frames together, backs facing each other. Carefully hot glue down the sides so that the picture frames stay together. Once you’ve assembled the little triangle, and you have the pictures in the frames, place the tealight candle in the middle. It’s important to use a flameless tealight candle for this because a regular candle would make the picture frames too hot and could potentially start a fire. Voila – you have an adorable and clever wedding shower centerpiece that your guests (and the bride) will love!